Discover magazine tells readers why people believe in God. It’s simple: Evolution fooled us! But in fact the article is a perfect case study in how a sweeping story of “evolution” gets credit for just about anything. Pattern-seeking is about seeing cause-and-effect relationships. There’s a connection between the shape of a lion’s paw-print and the existence of actual lions. Evolution produced that awareness in us so that (continuing the same example) we wouldn’t get gobbled by lions. Inferring intentions has to do with recognizing “that others have beliefs, desires and goals, influencing their actions.” Evolution gave us that ability so we could have social relationships. Then there’s learning by imitation, which is a great way to know what to eat and what not to eat, how to cook, how to hunt, how to find shelter and so on. Evolution obviously had to build that in us — there’d be no “us” without it. There’s more to this than debunking just one article. This is the way evolution stories are written. Always. Everything I’ve read about “how evolution did this,” or “how evolution did that” depends on unproven, often unscientific assumptions like the five listed here. It’s especially a problem in popular writing, but it’s common in technical articles, too. We need to keep our antennae up for these assumptions. We need to train our kids in how to spot them. It’s about thinking clearly and rationally, knowing the difference between demonstrated facts and unproven assumptions. It isn’t just about fending off evolution, in other words. Still, it’s worth noticing how often good critical thinking can spot these kinds of deep holes in evolutionary explanations. People who want to prove evolution just don’t seem to be able to get anywhere without assuming they’re already there. That’s the story, says Alex. Evolution wired all that into us; but it messed up, too. It didn’t include a “stop” switch to tell us where not to use those tendencies. We see patterns that aren’t real, and we conclude falsely that someone must have put them there on purpose. Some things we learn by imitation aren’t so good after all. So for example we see patterns in weather, and we attribute them to some kind of person. We call that person a god; then we imitate one another in worshiping that god. Voila, it’s religion! You have to assume your thinking is rational, even while you’re building a theory of pervasive human irrationality. You have to assume that all religious belief is irrational. This requires ignoring or dismissing centuries of solid Christian thinking in support of the rational truth of Christianity. You have to assume we have useful abilities like pattern recognition only because evolution gave them to us. That means you must ignore the possibility that God could have given them for the same and perhaps other reasons. You have to assume “evolution” is true in its strongest, materialist, sense. (That’s key.) That is, that all of life is the product of an entirely blind process of natural selection and random variation, with no role left for a Creator. Now, the author is free to make that assumption (even though I don’t agree with it). Almost all of Discover’s readers believe in this type of evolution, so she’s not responsible in this article to prove it to them again. Still, the rest of us are free to take note that there’s plenty of evidence against this Grand Darwinian Story. You have to assume that because “evolution is true,” evolutionary answers must also be true. In this way adaptive mental abilities could have led to religious beliefs. Evolved features of our brains, such as Theory of Mind and over-imitation, likely caused the emergence of religions in human societies. “Could have.” “Likely caused.” Even granted the assumptions, she still can’t establish the conclusion. No scientist saw any of these things happen. No one has any direct evidence for them. Nothing is demonstrated; it all rests on layers and layers of assumptions. This isn’t science. It’s a pile of assumptions floating in mid-air. 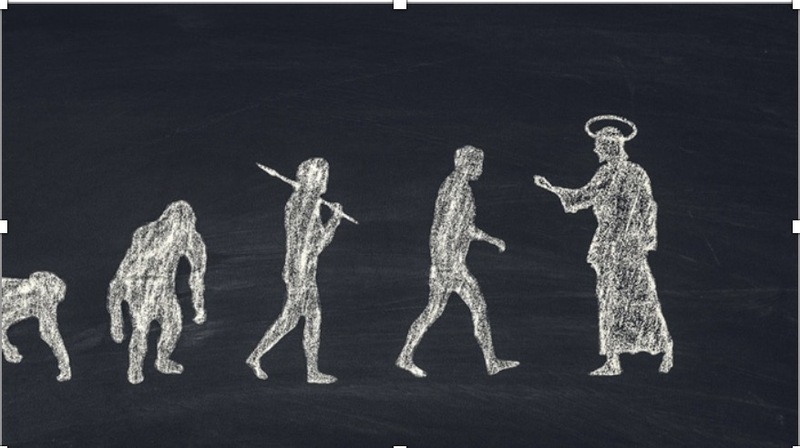 The article claims (Darwinian) evolution fools us into believing in God. I’d say it’s the other way around: Disbelieving in God fools people into believing in evolution.